The Red Skull was appointed by Hitler as a means of intimidation during WWII. He was the evil face of the Nazi party (if you will) while Hitler remained a popular leader of Germany. His role was to essentially spread fear for the Nazi party, a job he took special pride in. 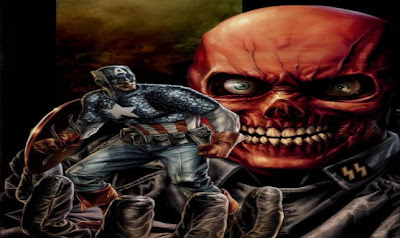 The United States countered the Red Skull and his fear with patriotism in Captain America. The two would obviously become arch rivals during WWII. Both characters nearing the end of the war are lost to suspended animation only to be later discovered and revived in present day. The idea of seeing Hugo Weaving is absolutely mouth watering. Weaving is a perfect choice to play a wicked and ruthless fear monger. I recently re-watched The Matrix and his interrogation scene opposite Laurence Fishburne as Morpheus is a perfect example of how well Weaving will do in the role of Johann Shimdt or more well know as the Red Skull. Considering Joe Johnston and Weaving recently did Universal's The Wolf Man together, it goes without saying Weaving will be the Red Skull.